To import data from Xero > Select ‘Add a Company’ > then select ‘Xero’ as the source. The first time Fathom connects to your Xero organisation, you must authorise Fathom to access your data from Xero. You’ll only need to do this once for each Xero organisation. Please note: Only users with 'Advisor' or 'Standard' permissions in Xero will be able to authorise access to the Xero data. When you return to Fathom, you can select the period range of data that you wish to retrieve from Xero. See this article for more information on managing date ranges. If you'd like to import a financial budget, select 'include budgets' during your financial import. Budget data from the 'Overall Budget' will then be imported from Xero. This data is useful for setting targets and also enables budget vs actual variance analysis as well as forward projections. Note: You can also import a budget from Excel, as opposed to Xero. 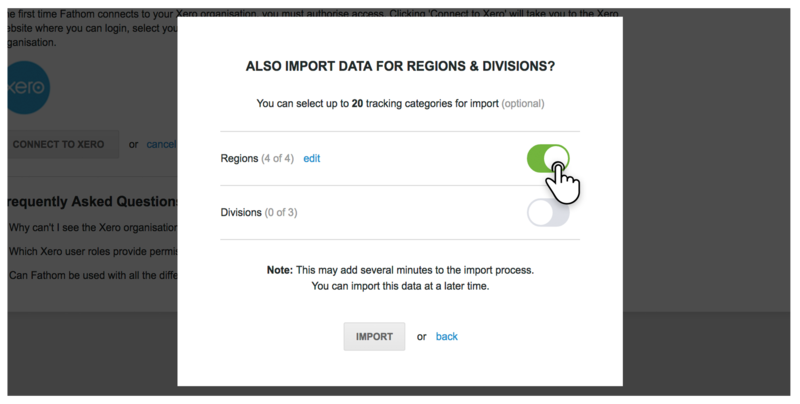 Fathom allows you to import tracking category data for analysis. This can be done either during the initial import, or when updating a company that is already in the platform. 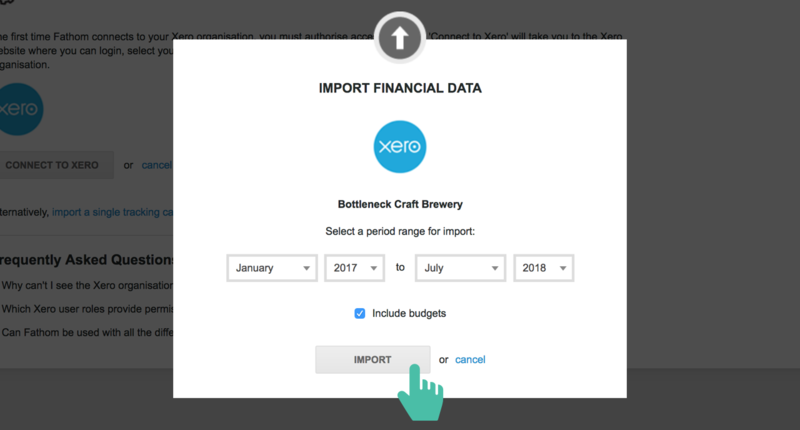 When you're ready to import your financial data from Xero, click ‘Import’. By default, Fathom will automatically update your financial and budget data from Xero on a daily basis. This setting can be toggled on or off in 'Step 1 - Update Data' of the company setup. At anytime, you can manually update the data in Fathom by selecting 'Update from Xero' in 'Step 1 - Update Data' of the company setup. This will synchronise the data in Fathom with the data in Xero at that point in time. If required, you can also update the budget from Xero. To connect a Xero company, you must be an 'Advisor' or 'Standard' level user with the 'View Reports' permissions set to 'All Reports' in that specific company. If you cannot find your company in the list that Xero presents, you'll want to check on the permission levels in Xero before reattempting the import.